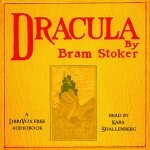 Dracula was posted on August 10th, 2016 at 7.36am and is filed under Audiobooks, Blog. This entry has 2 comments. You can follow any responses through the RSS 2.0 Feed. Librivox’s 11th anniversary is today, August 10th 2016! We had a 6-week drive to finish nearly 200 books in order to reach 10,000 books by our anniversary, and we not only reached that goal easily but we surpassed it by 22 books. We now have 10,022 free audiobooks in our catalog! Everyone pitched in — book coordinators chased down languishing chapter claims, narrators helped out with books that were lingering unfinished, proof-listeners took on extra work, admins cataloged the finished books, our cover team made cover art for all these extra books, and many soloists put in an extra effort to finish up those solos that were close to completion. That’s what I did. I wasn’t planning to finish Dracula till December, but I really pushed myself in those few hours when I felt ok (and the house was relatively quiet) and got it done in time to be part of the 10,000! My proof-listener, Mark, managed to get all those long chapters proofed when he wasn’t playing with his grandkids, and Ann cataloged it swiftly. Thanks again, your presence in our family is felt and heard! I sincerely wish you good health and hope your new meds/dosage are helpful. Also, I can’t wait to listen to Dracula on my commute tomorrow!